Taking their inspiration from cellular membranes, researchers from the Institut Européen des Membranes (CNRS / ENSCM / Université Montpellier 2) in collaboration with the Institut de Chimie Radicalaire (CNRS / Aix-Marseille Université) have developed the first dynamic membrane for water filtration which, depending on the water pressure, can adjust the size of its pores in an autonomous manner. In addition, it is capable of repairing itself if it breaks, thereby prolonging its lifetime and ensuring greater safety of the filtered product. This research is published in the journal Angewandte Chemie. Whether made of ceramics or polymers, membranes are used in a wide range of applications, particularly in the pharmaceutical and food processing industries. Also involved in water desalination and the production of drinking water, the membrane market is growing by 10% each year. The membranes used until now are fixed structures, i.e. the size of their pores cannot be adjusted. Furthermore, they are liable to tear which, if not immediately detected, can be a health hazard. Taking inspiration from cellular membranes, the team of researchers has developed a novel type of filter: a dynamic membrane whose pore size can be made to vary as a function of the pressure of water flowing through it. 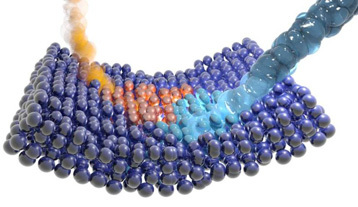 This membrane is made of a combination of three polymers with different solubilities that form micelles, nanoparticles in constant interaction with each other. Up to a certain pressure, when the force of water increases, these micelles have a tendency to flatten out and thus reduce the size of the pores within the membrane. For instance, at a low pressure of approximately 0.1 bars, the size of the pores is around 5 nanometers (1), which allows macromolecules and viruses to be filtered. By moderately increasing the pressure, pores of the order of 1 nanometer are obtained, which blocks the passage of salts, colorants and surfactants. However, if the pressure is raised to 5 bars, the morphology of the membrane undergoes a drastic change and the pores reach a diameter of more than 100 nanometers, which instead makes it possible to filter bacteria and suspended particulate matter. This unique property will allow users to employ a single type of membrane for all their filtration requirements. But that is not all: these 1.3 micrometer-thick dynamic filters are capable of self-healing. If the membrane tears, the physical equilibrium that holds the micelles together is broken. The micelles then seek to restore this equilibrium and reorganize themselves so as to fill the tear. A perforation 85 times larger than the thickness of the membrane can thus be repaired without human intervention and without stopping the filtration operation. This self-healing ability means it is possible both to extend the lifetime of membranes and to enhance health safety guarantees. Schematic representation of a membrane failure (red impact) immediately repaired by water flowing through it (blue). 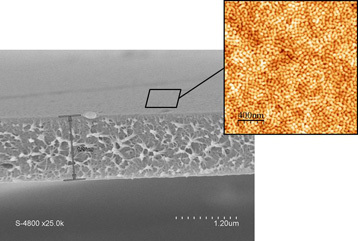 Scanning electron microscopy image of the membrane with an atomic force microscopy enhancement of the surface. Dynamic Interactive Membranes with Pressure-Driven Tunable Porosity and Self-Healing Ability. Prashant Tyagi, André Deratani, Denis Bouyer, Didier Cot, Valérie Gence, Mihail Barboiu, Trang N. T. Phan, Denis Bertin, Didier Gigmes, Damien Quemener. Angewandte Chemie. 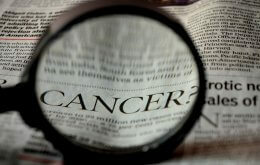 Published on-line on the 13 June 2012. DOI: 10.1002/anie.201201686.